Any mother will tell you it is hard to record memories about their child or children, since they never find the time to. What’s even worse is that a mother would never think to find time to write about themselves. But let me ask you, in years from now, don’t you want your children to have a personal record of your life as well as theirs? Sure, you will share the memories, and you will take pictures and maybe video. But I can tell you from personal experience that having a written word from a parent later in life is a true treasure. If you could compare your family members to fictional characters (from books, movies, etc) who would they be? What makes you laugh, and what do you laugh about? What people or events have shaped your spirituality? As you can see, some questions encourage you to go deep while others are playful and can be answered straight away. The nice thing is that there is no one direction in writing in this journal. Since I started, I find I jump from one category to another, depending on what catches my eye and what I feel like writing about that day. Once you start, you will find you have a lot to say to your children that you might never have even thought of as a relevant or interesting anecdote. What I also like about this journal is that it is not too overwhelming. There is just enough in the journal to explore and challenge yourself, leaving your children a true keepsake in the passing years. 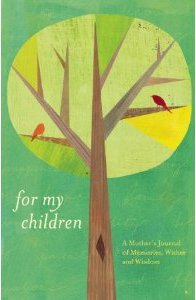 For My Children is a beautiful gift to give a new mama this holiday, or any mama for that matter. Surely a new mama will be happy to receive it, but a veteran mama and/or grandmama will also be just as touched. That being said, one lucky reader will win a copy of For My Children just in time for the holidays! I write the cute things they say and do down in my agenda (yes, I still use a paper agenda!). That way I know when it took place and i plan (one day) to copy it into their baby books. I’ll take pictures of their first steps and take lots of videos!!! My children are adults now, but as they were growing up, I made each one their own recipe book with their favorite recipes that I made. I put recipes from Grandma, Aunts & friends, anything that that child liked. When they moved to their own home, they had a unique recipe book filled with all of their favorite things and a whole lotta love, too.